The Australian Federal Government is poised to pledge millions of dollars in sweeteners for Australian households who are facing the possibility of higher bills under the proposed carbon tax. Climate Change Minister Greg Combet will use a speech at the National Press Club later today to release key details of the proposed compensation for households under the scheme. He says pensioners and the low-paid will be the priority for compensation and says most families will actually be better off under the plan. The Government has maintained all revenue from the scheme will be used to compensate households and sensitive industries, and support energy efficiency and new technologies. "What we're making clear today is that more than 50 per cent of the carbon price revenue will be used to assist households and that we expect that millions of households will be better off under the carbon price arrangements," Mr Combet told ABC's AM. "Obviously as a Labor Government, we're concerned to help low and middle income households as much as we can." He says for most families, compensation will outweigh the higher cost of living that will be generated by the tax. "It's very important that we ensure that people have got the assistance they need to meet any price impacts," he said. "Providing that assistance doesn't remove the incentive for them to become more energy efficient with the assistance that's provided, if they can improve their energy efficiency and reduce their energy use, that cash will become available for help elsewhere. "There's a variety of ways that we can deliver this assistance. One of the most efficient ways is through a tax and transfer system ... but we haven't finalised the detail of the delivery arrangements at this point in time." Mr Combet will also reveal that compensation for households will be permanent - neutralising one of the Opposition's key lines of attack. But he says the scheme is not designed on the basis of "endeavouring to snooker anybody". The announcement is not expected to contain exact details about how much the compensation will be as the carbon price itself has not been determined. Finance Minister Penny Wong has said the price and compensation levels will not be revealed until after next month's federal budget. The compensation package will need the backing of the Greens and independents. The latest Nielsen opinion poll shows federal Labor's support hitting a 15-year low as it tries to head off a business revolt over the carbon tax. Today's poll in the Fairfax press shows Labor's primary support slumping two points to 31 per cent, its lowest point since the aftermath of the Keating government's defeat in May 1996. The poll also says almost two-thirds of Australian voters are opposed to the Government's proposed carbon tax. It says opposition to the tax has risen three points to 59 per cent, whereas support remains unchanged at 34 per cent. Meanwhile the Food and Grocery Council has joined the steel industry and other manufacturers speaking out against the tax. The council is one of 45 business groups to sign a letter to Prime Minister Julia Gillard asking for assurances they will not be disadvantaged under the tax. Council CEO Kate Carnell says there is no doubt that goods manufactured in Australia will cost more under a carbon price. "If imports are cheaper than the Australian manufactured goods, our experience is that Australians will buy imports and that's why giving Australian taxpayers some money to compensate them for the carbon tax doesn't help us at all,' she told AM. "It just means they've got more money potentially to buy cheaper imported goods. It doesn't mean that they'll pay the extra for Australian-manufactured goods." Today's poll shows Coalition's primary vote increasing, rising two points to 47 per cent. The Coalition now leads Labor 56 points to 44 on a two-party preferred basis. 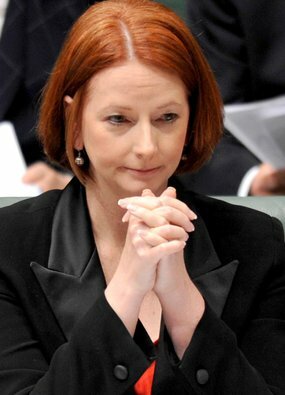 In more bad news for Ms Gillard, the poll shows a majority of voters want her predecessor Kevin Rudd back in The Lodge. Mr Rudd, who was ousted by Ms Gillard after climbing down over his emissions trading scheme, leads her by 55 points to 38 in the preferred prime minister standings. Malcolm Turnbull leads Tony Abbott by 41 per cent to 28 per cent as preferred opposition leader.